You can also participate live, using social media sites (in the past organizers have used Twitter) to respond to questions or follow conversations by tweeting or using the hashtag #RootsTech or #NotAtRootsTech. You can also follow discussions about RootsTech on social media sites by searching for the hashtag #RootsTech or #NotAtRootsTech. 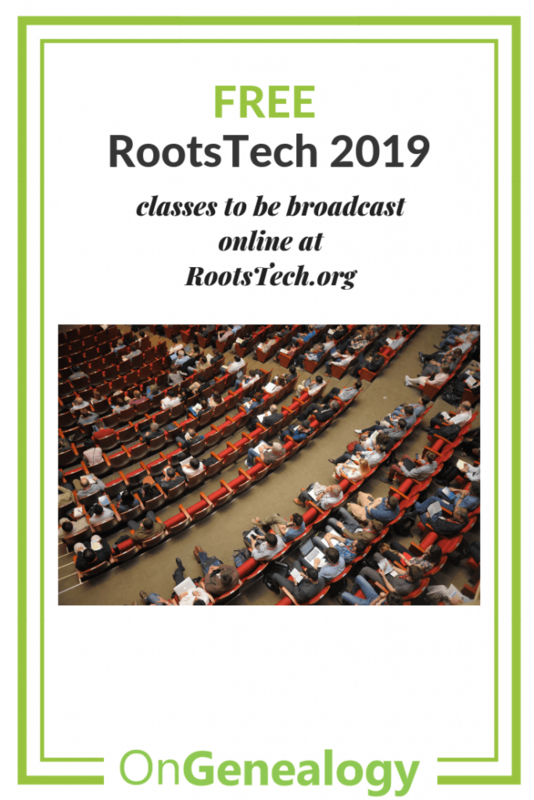 *RootsTech 2019 Salt Lake City also has a Virtual Pass for $129 which will allow you to see other select classes on a computer, smartphone, or device at your convenience with playback features. I’ll post updates about RootsTech to share what I’m learning and seeing but nothing will replace your own firsthand experience, so be sure to visit RootsTech.org and catch a class or two if you’re not able to attend in person. Want some more freebies? Check out At #RootsTech or #NotAtRootsTech – One Tip You Need and How to Find Free Genealogy Handouts. There’s plenty of great learning you can access from the comfort of your own home. Best in your research!